I have now completed the revision of the Thorpe Colour Table which corrects a previous error, revises the format of the table for ease of reference and includes some additional notes. Please see the sidebar to request a copy. Because of continuing confusion over whether late-war Army aircraft were green or brown (they were both!) 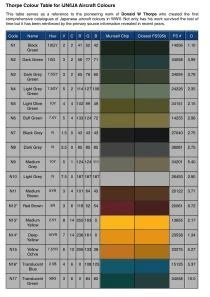 I will be preparing a separate short post or pdf guide to Army colour # 7 and related information. This is essentially an extract from a much larger treatise on Army colours but seems to be needed now. The situation has been much confused by artwork, chips, kit manufacturers instructions and colour descriptions which have all tended to confuse the characteristics of this important colour. BTW Donald W Thorpe's original books are essential to a full understanding and use of the table. Although long out of print they can still be obtained from second-hand sources and are highly recommended. I need some advice. I am begining a Kit of the Nakajima Gekko (Irving)Nightfighter. According to the instructions, the aircraft was painted overall blackgreen with black cowlings. According to Donald Thorp's book about Japanese Navy Aircraft, nightfighters were painted overall blackgray. Could you enlighten me or put me in touch with someone who can guide me on this paint scheme? Recent research and the evidence from Japanese sources tend to support the notion that a very dark, almost black, green was applied to Gekko rather than a black-grey (which was applied to the cowlings).